1) Gmail defaults to adding contacts for anyone you interact with. I had 1500 spurious contacts (newsletters, web service email endpoints, e-commerce sites, etc) to weed through. I couldn't easily find my actual friends. 2) There's no way to say "Don't recommend these contacts to me any more", meaning, if I tried to "Find friends" to import a small list, they'd just be mingled into those 1500 useless addresses. 3) There's no link to your Google Contacts to manage who is showing here. 1a) Provide a way to dismiss or not show people. 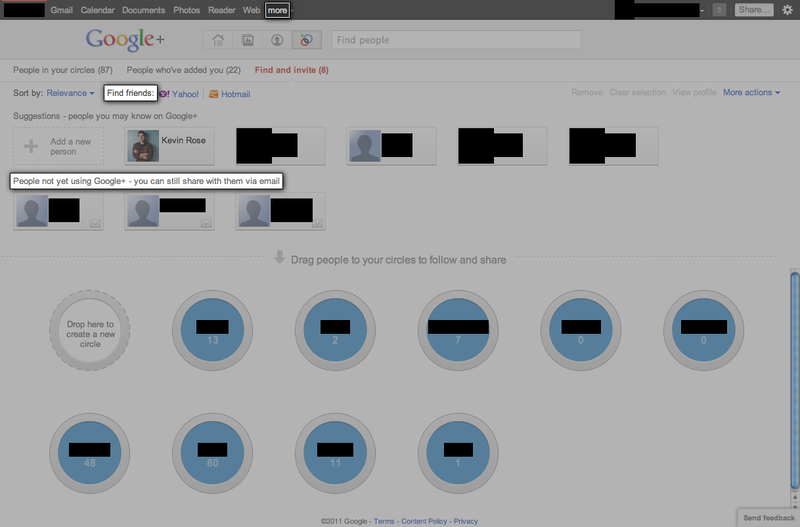 1b) Consider supporting a "Show in Google Plus" group in Google Contacts. 3) Under "more" menu, or somewhere more prominent such as after the "still share with them via email" phrase, add a Contacts link so I can get to and manage my contacts.